George Frederick Handel. Very Good. In very good packaging. 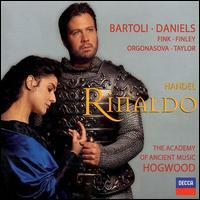 Handel-Rinaldo / Bartoli, Daniels, Fink, Finley, Orgonasova, Taylor, AAM, Hogwood. Very Good. 028946708729 We cannot ship expedited. Expedited orders will be auto cancelled. U. New. 028946708729 New with original packaging intact. We ship in recyclable American-made mailers. 100% money-back guarantee on all orders.